Explanation of the Hadith of the Rock, the Gharqad Tree, and the Jews: Did Prophet Muhammad Command Muslims to kill all Jews? Is this narration telling Muslims that killing Jews is a good deed? This narration is describing a specific miraculous event which will occur near the end of time. It is not a narration from which is derived a legal ruling. In other words, this narration is a description, not a prescription. For this reason, the scholars recorded this narration in the books of tribulations near the end of time and portents of the Hour; and they did not record it in the books of legal punishment. It is He who has sent down to you the Book; in it are verses that are precise – they are the foundation of the Book – and others unspecific. As for those in whose hearts is deviation, they will follow that of it which is unspecific, seeking discord and seeking an interpretation. Therefore, we need to place this narration in its proper context so that Muslims will not act upon it wrongly and thereby commit transgression. The False Messiah would be followed by seventy thousand Jews of Isfahan wearing Persian shawls. The False Messiah will emerge and I will have with me two bars; so when he sees me he will melt away like the melting of lead. Allah will destroy him until the stone and the tree say: O Muslim, underneath me is an unbeliever, so slay him; thus, Allah will destroy them. It is these particular Jews, not all Jews, whom Muslims will fight and they will be aided by miracles from Allah. An army of seventy thousand is quite modest by today’s standards, a mere fraction of the total Jewish population; so it cannot be said that all Jews, or even most Jews, will join the False Messiah. They are not all the same; among the People of the Scripture is a community standing, reciting the verses of Allah during periods of the night and prostrating in prayer. They believe in Allah and the Last Day, and they enjoin what is right and forbid what is wrong and hasten to good deeds; and those are among the righteous. Whatever good they do – never will it be removed from them; and Allah knows the righteous. Among the people of Moses is a community which guides by truth and by it establishes justice. Allah does not forbid you from those who do not fight you because of religion and do not expel you from your homes – from being righteous toward them and acting justly toward them. Indeed, Allah loves those who act justly. Allah only forbids you from those who fight you because of religion and expel you from your homes and aid in your expulsion – He forbids that you make allies of them; and whoever makes allies of them, then it is those who are the wrongdoers. Allah does not forbid you from those who do not fight you because of religion – including all the sects, creeds, and religions – that you behave righteously with them, maintain good relations with them, and act fairly with them. The Prophet, peace be upon him, passed away while his armor was mortgaged to a Jew for thirty units of barley. The Jews of Bani Awf are one community with the believers. The Jews will profess their religion; and the Muslims their religion. Mukhayriq is the foremost among the Jews. Mukhayriq was the best of the Jews. Whoever kills a person protected by a treaty will never smell the fragrance of Paradise, and indeed its fragrance can be found a distance of forty years of travel. If anyone wrongs a person protected by a peace treaty, detracts from his rights, burdens him with more work than he is able to do, or takes something from him without his consent, then I will plead for him on the Day of Resurrection. Violent extremists who cite the narration of the rock and Gharqad tree as evidence have grossly misunderstood the principles of interpretation, whether by ignorance or on purpose. If they use such narrations in order to justify transgression against the Jewish people, then they will surely be surprised on the Day of Resurrection when Prophet Muhammad, peace be upon him, comes as an advocate on behalf of oppressed Jews against the Muslims who oppressed them. The narration of the rock and Gharqad tree describes (not prescribes) a specific event which will occur near the end of time, a battle involving Muslims and hypocrite Jews who will follow the False Messiah. It does not describe a battle with all Jews, or even most Jews, and it is not permissible to use this narration in order to make lawful the killing of peaceful Jews. Rather, this narration, whose meaning is unclear, must be referred to other narrations whose meanings are decisively clear; in other words, this specific narration must be interpreted in light of other narrations whose meanings are general. These other narrations inform us that the Prophet, peace be upon him, was careful to maintain amicable relations with Jews and this attitude was passed down from him to his companions. Violent extremists and anti-Muslim activists like to cite this narration out of context in order to spread discord and hatred among Jews and Muslims. We seek refuge in Allah from their corruption and we pray that Allah Almighty will open their hearts to the light of Islam, and bestow upon them a proper understanding of this tradition. I am sitting here writing this article 39 years to the minute from that moment when the sirens started screaming, announcing the beginning of the war. Inevitably, the memory starts to work. This year, many new documents were released for publication. Critical books and articles are abundant. The universal culprits are Golda Meir and Moshe Dayan. They have been blamed before, right from the day after the war, but only for superficial military offences, known as “the default”. The default was failing to mobilize the reserves, and not moving the tanks to the front in time, in spite of the many signs that Egypt and Syria were about to attack. Now, for the first time, the real grand default is being explored: the political background of the war. The findings have a direct bearing on what is happening now. It transpires that in February 1973, eight months before the war, Anwar Sadat sent his trusted aide, Hafez Ismail, to the almighty US Secretary of State Henry Kissinger. He offered the immediate start of peace negotiations with Israel. There was one condition and one date: all of Sinai, up to the international border, had to be returned to Egypt without any Israeli settlements, and the agreement had to be achieved by September, at the latest. Kissinger liked the proposal and transmitted it at once to the Israeli ambassador, Yitzhak Rabin, who was just about to finish his term in office. Rabin, of course, immediately informed the prime minister, Golda Meir. She rejected the offer out of hand. There ensued a heated conversation between the ambassador and the prime minister. Rabin, who was very close to Kissinger, was in favour of accepting the offer. Meir treated the whole initiative as just another Arab trick to induce her to give up the Sinai Peninsula and remove the settlements built on Egyptian territory. Even before the new disclosures, the fact that Sadat had made several peace overtures was no secret. Sadat had indicated his willingness to reach an agreement in his dealings with the UN mediator, Dr Gunnar Jarring, whose endeavours had already become a joke in Israel. Before that, the previous Egyptian President, Jamal Abd-al-Nasser, had invited Nahum Goldman, the president of the World Jewish Congress (and for a time president of the World Zionist Organization) to meet him in Cairo. Meir had prevented that meeting, and when the fact became known there was a storm of protest in Israel, including a famous letter from a group of eighth-graders saying that it would be hard for them to serve in the army. All these Egyptian initiatives could be waved aside as political maneuvers. But an official message by Sadat to the secretary of state could not. So, remembering the lesson of the Goldman incident, Golda decided to keep the whole thing secret. Thus, an incredible situation was created. This fateful initiative, which could have brought about an historic turning point, was brought to the knowledge of two people only: Moshe Dayan and Israel Galili. The role of the latter needs explanation. Galili was the eminence grise of Meir, as well as of her predecessor, Levy Eshkol. I knew Galili quite well, and never understood where his renown as a brilliant strategist came from. Already before the founding of the state, he was the leading light of the illegalHaganah military organization. As a member of a kibbutz, he was officially a socialist but in reality a hardline nationalist. It was he who had the brilliant idea of putting the settlements on Egyptian soil, in order to make the return of northern Sinai impossible. So the Sadat initiative was known only to Meir, Dayan, Galili, Rabin and Rabin’s successor in Washington, Simcha Dinitz, a nobody who was Meir’s lackey. Incredible as it may sound, the foreign minister, Abba Eban, Rabin’s direct boss, was not informed. Nor were all the other ministers, the chief of staff and the other leaders of the armed forces, including the chiefs of Army Intelligence, as well as the chiefs of the Shin Bet and the Mossad. It was a state secret. There was no debate about it – neither public nor secret. September came and passed, and on 6 October Sadat’s troops struck across the canal and achieved a world-shaking surprise success (as did the Syrians on the Golan Heights). As a direct result of Golda’s grand default, 2,693 Israeli soldiers died, 7,251 were wounded and 314 were taken prisoner (along with the tens of thousands of Egyptian and Syrian casualties). This week, several Israeli commentators bemoaned the total silence of the media and the politicians at the time. Well, not quite total. Several months before the war, in a speech in the Knesset, I warned Golda Meir that if Sinai was not returned very soon, Sadat would start a war to break the impasse. I knew what I was talking about. I had, of course, no idea about the Ismail mission, but in May 1973 I took part in a peace conference in Bologna. The Egyptian delegation was led by Khalid Muhyi-al-Din, a member of the original group of Free Officers who made the 1952 revolution. During the conference, he took me aside and told me in confidence that if Sinai was not returned by September, Sadat would start a war. Sadat had no illusions of victory, he said, but hoped that a war would compel the US and Israel to start negotiations for the return of Sinai. My warning was completely ignored by the media. They, like Golda, held the Egyptian army in abysmal contempt and considered Sadat a nincompoop. The idea that the Egyptians would dare to attack the invincible Israeli army seemed ridiculous. Ours was a voice crying in the wilderness, but at least we fulfilled one function: In herMarch of Folly, Barbara Tuchman stipulated that a policy could be branded as folly only if there had been at least one voice warning against it in real time. Perhaps even Meir would have reconsidered if she had not been surrounded by journalists and politicians singing her praises, celebrating her wisdom and courage and applauding every one of her stupid pronouncements. The same type of people, even some of the very same people, are now doing the same with BinyaminNetanyahu. Again, we are staring the same grand default in the face. Again, a group of two or three are deciding the fate of the nation. Netanyahu and Ehud Barak alone make all the decisions, “keeping their cards close to their chest”. Attack Iran or not? Politicians and generals are kept in the dark. Bibi [Netanyahu] and Ehud know best. No need for any other input. But more revealing than the blood-curdling threats on Iran is the total silence about Palestine. Palestinian peace offers are ignored, as were those of Sadat in those days. The ten-year old Arab peace initiative, supported by all the Arab and all the Muslim states, does not exist. Again, multitudes of flatterers, media stars and politicians compete with each other in adulation of “Bibi, King of Israel”. How smoothly he can talk in American English! How convincing his speeches in the UN and the US Senate! Well, Meir, with her 200 words of bad Hebrew and primitive American, was much more convincing, and she enjoyed the adulation of the whole Western world. And at least she had the sense not to challenge the incumbent American president (Richard Nixon) during an election campaign. In those days, I called our government “the ship of fools”. Our current government is worse, much worse. Golda and Dayan led us to disaster. After the war, their war, they were kicked out – not by elections, not by any committee of inquiry, but by the grassroots mass protests that racked the country. 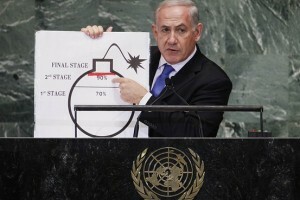 Bibi and Ehud are leading us to another, far worse, disaster. Some day, they will be kicked out by the same people who adore them now if they survive. First of all, the Palestinians are aware that this speech is an attempt to salvage some part of what he failed to obtain with his previous UN bid. Last year, the Palestinian Authority tried to obtain full statehood. Now, even though some news outlets still are using the term ‘statehood bid’ in their headlines, Mahmoud Abbas addressed the UN in the hope of obtaining “non-member state” status in the United Nations – a large step back from last year. The original Jewish Museum in Berlin was founded on Oranienburger Straße in 1933, but was closed soon thereafter, in 1938, by the Nazi regime. In 1975 an “Association for a Jewish Museum” formed and, three years lated, mounted an exhibition on Jewish history (1978). Soon thereafter, the Berlin Museum, which chronicled the city’s history, established a Jewish Department, but already, discussions about constructing a new museum dedicated to Jewish history in Berlin were being held. BERLIN – The internationally renowned Jewish Museum in Berlin hosted a podium discussion on Saturday with US academic Judith Butler, who renewed her calls to boycott Israel. It appears to be the first anti-Israel event held in the Jewish museum since its opening in 2001 with the aim of exhibiting the 2,000- year history of Germany’s Jews. At least 700 people attended the event. The German taxpayer-funded museum’s decision to showcase the speaker Butler in the capital city, which during the Nazi period served as the launching pad for a boycott movement against German-Jewish businesses, has raised eyebrows about the management’s direction of the museum. Butler, a professor in the rhetoric and comparative literature departments at the University of California, Berkeley, told a sold out audience in the courtyard of the museum that she accepts a “version of a boycott” against Israel, and stressed that the Boycott, Sanctions, and Divestment (BDS) movement is “non-violent resistance” against Israel. She claimed that “1,000 Jewish groups” agree with her. The city of Frankfurt has been engulfed in a nearly three week row over the city’s cultural agency decision to honor Butler on September 11 with its prestigious Theodor Adorno award for excellence in the field of humanities. When queried by the Post about Butler’s support for boycotts against Israel and her ostensibly cordial words for Hamas and Hezbollah, Kugelmann added that “in our team there are certainly many attitudes and positions.” She declined to return calls and additional email queries about whether museum team members share Butler’s pro-BDS views and descriptions of Hamas and Hezbollah as progressive left-wing groups. Katharina Schmidt-Narischkin, the Jewish museum’s spokeswoman, told the Post on Friday that attendees are not allowed to ask Butler questions about Hamas and Hezbollah. She wrote the Post on Saturday that ”audience questions” will not take place. The museum did , however, collect written audience questions at the end of the event and assessed which questions to permit. Butler triggered intense criticism in Germany, Israel and the US because of her 2006 comment at a “Teach-in Against War “ event that “Understanding Hamas/Hezbollah as social movements that are progressive, that are on the Left, that are part of a global Left, is extremely important.” In an August email to the Post, she watered down her assertions and said her description does not mean she endorses Hamas and Hezbollah and she rejects violent movements. “I have never taken a stand on either organization,” wrote Butler. She declined to answer Post queries about her exact view of the two radical Islamic organizations. Blumenthal noted in his letter that the appearance of Dr. Micha Brumlik at the discussion serves as a counterweight to Butler. Brumlik, a liberal German Jewish professor of pedagogy, argued against BDS actions targeting Israel at the event but was drowned out and not taken seriously by the largely pro-Butler audience. A German Jewish academic at the event expressed dismay over the discussion at the museum. She told the Post that “Anti-Zionism is enormous in Germany,” and the political and historical context is different in Germany. Critics in the Federal Republic have long argued that non-Jewish organizations and politicians frequently award prizes to anti-Zionist and anti-Israel Jews to vent their biases against the Jewish state and thereby avoid accusations of anti-Semitism or prejudice. The Palestinian people extend their gratitude and appreciation to the World Social Forum and all social movements participating in the special forum on Palestine, which will be held at the end of this year. We particularly thank Brazil, its government and its institutions, for hosting this forum, which we regard as a crucial and extraordinary landmark in a process that will widen support for our people’s struggle to exercise our inalienable rights: the right of return, self-determination, and an independent state with Jerusalem as its capital. Despite the passage of more than six decades since the Nakba, the systematic ethnic cleansing of a majority of the Palestinian people in 1948, the Palestinian cause is still a global issue inspiring people of conscience and social movements around the world. Effective solidarity with the Palestinian people and its inalienable rights — especially the right of return of refugees to their homes and the right to self-determination — is today stronger than ever, reinforcing the struggle of the Palestinian people, under the leadership of the Palestine Liberation Organization, for freedom and justice, in accordance with international law and universal principles of human rights, both pillars of the World Social Forum. The organization of the World Social Forum Free Palestine is an expression of the unity of international social movements — fighting against imperialism, neo-liberalism and racial discrimination in all its forms — in considering the just struggle for the Palestinian rights an integral part of the international struggle to develop political, social and economic alternatives that enhance justice, equality and sovereignty of the peoples on the basis of social-economic justice, human dignity and democracy. b. Develop mechanisms for effective global action in support of the struggle of the Palestinian people to exercise its inalienable rights, foremost among them the right of return and self-determination, and to enforce international law and human rights. c. Provide an open space for debate, dialogue, developing strategies and planning for effective and sustainable campaigns in solidarity with the Palestinian people, and to hold the Israeli occupation accountable, illegitimate, and subject to sanctions. 7) Supporting and strengthening the struggle for the release of Palestinian prisoners and detainees who are languishing in Israeli prisons for their involvement in the Palestinian national liberation struggle and recognizing their status as prisoners of war and freedom fighters. In this context, we emphasize the need to secure the immediate and unconditional release, as a matter of top priority, of sick, elderly, child and women prisoners as well as administrative detainees, and the release of 27 parliamentarians who were kidnapped by the occupation authorities in clear violation of international law, as well as banning and criminalizing the policy of solitary confinement and administrative detention. 8) Pressuring world governments to fulfill their legal obligations, as stipulated in the decision of the International Court of Justice against Israel’s wall that is illegally built on occupied Palestinian territory, by applying pressure, in turn, on the Israeli government to dismantle the “wall of shame,” which is expected to reach about 800 km in length, and which has inflicted grave injustice and a new wave of ethnic cleansing on the Palestinian people, and urging them to reject and condemn the US administration’s use of its Veto at the UNSC against stopping the Israeli colonization of the Occupied Palestinian Territories. 14) Supporting Palestinian popular resistance against the Israeli occupation and oppression as a leading form of resistance that can contribute to changing the balance of local and international power to the benefit of our people, and promoting visits by international solidarity groups to occupied Palestine. Als bekeerling heb ik de vrijheid gehad om de keuze voor islam te maken. Ik weiger dan ook elke vorm van beperking te accepteren die indruist tegen mijn gevoel van rechtvaardigheid in relatie tot mijn geloof. Ook al wordt deze opgelegd in de naam van religie. In een hadith werd mijn gedachte bevestigd; de Profeet v.z.m.h. zei: “Als je een hadith hoort waar je hart ontvankelijk voor is, waar zowel je lichaam als je geest vrede mee hebben, en je voelt dat het acceptabel voor je is, dan is het zelfs meer acceptabel voor mij. Maar als je een hadith hoort waar je haren van overeind gaan staan, en waartegen je hart en je geest zich keren, en je voelt dat het onacceptabel (baʿīd) is, dan is het nog meer onacceptabel voor mij (overgeleverd door Bukhari en Hanbal). Ik had in het begin nooit echt stilgestaan bij de beperkende kant in de islam voor vrouwen, omdat die er volgens mij ook niet was. Althans zo had ik het opgemaakt uit de bronnen. Het bleek er in de praktijk wel eens anders aan toe te gaan, maar omdat dit voor mij onacceptabel leek besteedde ik er nooit veel aandacht aan. Mijn vraag naar vrouwelijke religieuze autoriteit in de islam rees echter toen ik een paar jaar geleden in Cairo was voor een studiereis. We hadden daar een ontmoeting met de mufti van Al Azhar-universiteit, wat zeer zeldzaam is, omdat hij een belangrijk en drukbezet man is. (mufti = een hoog rechtsgeleerde die ook geautoriseerd is om fatwa’s uit te brengen) Iedereen mocht een vraag aan hem stellen, en overdonderd als ik was kon ik niets meer uitbrengen dan de vraag of het ook mogelijk is voor vrouwen om mufti te worden? Een moment van stilte volgde, en hij zag duidelijk dat ik een bekeerlingen met een westerse achtergrond ben, waardoor zijn antwoord mogelijk diplomatieker was dan normaliter. Hij zei dat dit in theorie mogelijk was, maar dat het in de praktijk niet snel zou gebeuren omdat vrouwen toch vaak andere prioriteiten hebben. Daarna ging hij snel door naar de volgende vraag. Een paar jaar later bleek inderdaad dat dit niet snel zou gebeuren. Niet omdat een vrouw andere prioriteiten had, of omdat zij niet geschoold genoeg was, maar omdat de mannelijke raad van al-Azhar haar simpelweg niet koos. Dit betreft trouwens Souad Saleh, decaan van de theologische faculteit van al-Azhar, maar nog steeds geen mufti. Tot op heden zit er geen enkele vrouw in de grote raad van mufti’s van al Azhar. Dit was voor mij de aanleiding om te kijken naar vrouwelijke autoriteiten in de geschiedenis van de islam in het algemeen. Kunnen vrouwen bepaalde functies islamitisch gezien niet vervullen? Of willen mannen dat niet? Ik dacht altijd dat de schuld geven aan patriarchale interpretaties of een dominerende mannenwereld een te makkelijk en voordehand liggend antwoord was. Maar uit mijn onderzoek bleek niets minder waar. Een rijke wereld aan materiaal opende zich toen ik onderzoek ging doen naar vrouwelijke autoriteiten in de geschiedenis in de islam. Ik zocht niet alleen geleerden, maar vooral vrouwen die invloed en macht hadden, ook over mannen. Voor mij zijn dit absolute autoriteiten. In de nu beschikbare tijd kan ik de hele geschiedenis van invloedrijke moslimvrouwen niet toelichten, maar ik kan wel een paar voorbeelden noemen. Het bekendste voorbeeld is natuurlijk A’isha, de vrouw van de Profeet die niet alleen veel kennis bezat en doorgaf, maar die ook een belangrijke autoriteit, mufti en zelfs legeraanvoerder was. Maar vandaag kies ik voor minder bekende voorbeelden, op basis van diversiteit van de vrouwen en van hun boodschap. Ik wil daarmee niet alleen vertellen dat ze er waren, maar ook laten zien dat hun bijdrage nog steeds van belang is voor ons vandaag de dag. De vrouwen van toen zijn onze inspiratie voor het heden. De vrouwen van nu zijn de geschiedenis van morgen. De boodschap die zij vertellen, is voor mij universeel en kan dienen als absoluut voorbeeld, niet alleen voor vrouwen, maar ook voor mannen. “Ik wil het vuur van de hel doven, en de beloningen van het paradijs verbranden. Zij versluieren de weg naar God. Ik wil niet aanbidden uit angst voor straf of vanwege de belofte van een beloning, maar simpelweg alleen uit liefde voor God.” Rabi’a was zeer toegewijd aan God, en aan God alleen. Alle huwelijksaanzoeken die ze kreeg, wees ze dan ook resoluut van de hand. Een man zou haar alleen maar afleiden van wat echt belangrijk was; God. Rabi’a zelf schreef geen boeken; alles wat we over haar weten is opgeschreven door mannen. In de geschiedenis zijn er nauwelijks verhalen van vrouwen die zelf hun leringen opschreven. Waarom, dat blijft gissen. Schrijven konden ze vaak wel want het waren vaak grote geleerden. Dat het benoemen van vrouwen als leiders toen al een gevoelig punt was, zien we bijvoorbeeld aan de woorden van een bekende moslimschrijver uit de geschiedenis; Farid al-Din Attar, die zei: “Wanneer iemand mij vraagt, ‘Waarom heb je Rabi’a opgenomen in de rank van de mannen?’ Dan is mijn antwoord dat de Profeet zelf zei: ‘God houdt zich niet bezig met uw uiterlijke vormen.’ De kern van de zaak is niet vorm, maar intentie, zoals de profeet zei: ‘Mensen zullen worden gewaardeerd op basis van hun intentie.’ Daarnaast, als het gepast is dat wij twee-derde van onze religie afleiden van Aïsja (zoals dmv ahadith), dan is het toch zeker toegestaan om religieuze instructie te ontvangen van een volgeling van Aïsja’s (een vrouw).” Er zijn veel verhalen over Hasan, de grote theoloog van Basra, die bij Rabi’a op bezoek ging. Zij brachten vaak hele nachten gezamenlijk door, in discussie en in gebed. Hun band was zo nauw dat hij haar zelfs aan haar ziekbed kwam bezoeken. Hasan en Rabi’a waren goede vrienden en Rabi’a vond vooral onder mannen haar discipelen en vrienden; er valt nauwelijks te lezen over haar omgang met vrouwen. Zij ging op gelijke voet om met de geleerden van haar tijd en zij prezen haar. Opmerkelijk feit is dat Rabi’a zelf geen les kreeg van een sheikh of leraar. Haar leringen zijn uniek en van haarzelf. Prachtig vind ik haar inzicht van dat we Allah moeten aanbidden uit liefde voor Allah en niet uit angst voor bestraffing of verlangen naar beloning. Deze laatste motivaties zijn volgens mij uiteindelijk egoïstisch. Als we puur alleen het goede doen omwille van het Goede (met hoofdletter G) kunnen we onze intenties zuiveren van egoïsme en gaan voor oprecht altruïsme. De tweede vrouw die ik graag wil belichten is de juriste Nafisa. Zij overleed aan het begin van de derde eeuw hijra (208). Nafisa was een nazaat van de Profeet v.z.m.h. Ze was getrouwd met Ishaq, zoon van de grote Imam Ja’far al-Sadiq. Hij was de oprichter van de Shi’itische Ja’fari madhab (wetschool). Imam Ja’far werd zeer gerespecteerd binnen zowel sunni als sjia kringen. Nadat Nafisa met haar man twee kinderen kreeg vertrok ze naar Cairo met haar nicht Sakina. Nafisa kende de Koran en de commentaren uit haar hoofd en bezat zoveel religieuze kennis dat zelfs haar tijdgenoot Imam Shafi’i, oprichter van de soennitische Shafi’itische-wetsschool, regelmatig naar haar lezingen kwam om te luisteren en met haar in gesprek te gaan. Shafi’i’s respect voor de kennis van deze vrouw was zo groot dat hij tijdens de Ramadan samen met haar de speciale avondgebeden (tarawieh) bad. Er wordt gezegd dat zij hem de profetische traditie heeft geleerd, voor hem bad als hij ziek was en op zijn verzoek aanwezig was bij zijn overlijdensgebed. Uit recent onderzoek blijkt zelfs dat zij Shafi’i’s begrafenisgebed leidde; dus als imam fungeerde. Na haar dood wilde haar man Nafisa’s lichaam overbrengen naar Medina, maar de inwoners van Cairo smeekten hem om Nafisa bij hen te laten begraven. Haar graf is nog steeds te bezoeken in Cairo. In dit verhaal komen twee belangrijke aspecten naar voren. Ten eerste wordt duidelijk dat er in die tijd een uitwisseling van gedachten gaande was tussen Sjiieten en Soennieten en dat zij zoveel respect voor elkaar hadden dat zij zelfs samen het gebed verrichtten en religieuze kennis van elkaar leerden. Daarnaast zien we dat Nafisa omringd werd door enkele van de belangrijkste mannen in de geschiedenis van de islamitische jurisprudentie en dat zij Nafisa’s kennis en wetenschappelijke autoriteit meer dan accepteerden. Zij was een gelijkwaardige partner met autoriteit voor hen, zowel in discussie als tijdens het gebed. Nafisa is voor mij een ultiem voorbeeld als het gaat om religieuze autoriteit op het gebied van kennisoverdracht op theologisch gebied. Haar verhaal is een mooi voorbeeld hoe we vandaag de dag, door verschil binnen de ummah (islamitische gemeenschap) te accepteren, een stap richting een vredigere ummah kunnen doen. Tot nu toe heb ik vrouwen genoemd die vooral op spiritueel gebied of op het gebied van religieuze kennis autoriteit bezaten. Maar een vrouwelijk staatshoofd in de islamitische geschiedenis lijkt onmogelijk, zeker afgebeeld tegen onze tijd waarin moderne landen als de VS nog nooit een vrouwelijk staatshoofd hebben gehad. Iedereen kent natuurlijk hedendaagse voorbeelden als Benazir Bhutto in Pakistan, maar er zijn veel meer vrouwelijke politiek leiders in de islamitische geschiedenis geweest. De meerderheid van de moslimgeleerden achten een vrouwelijke khalief (een soort keizer van het toenmalige islamitische rijk) niet mogelijk. Toch was Sitt al-Mulk khalifah voor een paar dagen (vanuit Cairo). Nu is een paar dagen niet veel dus zal ik meer substantiële voorbeelden in de islamitische geschiedenis belichten. Zo regeerde Asma aan het eind van de 5e eeuw van de islamitische jaartelling over Yemen en zat ongesluierd besprekingen voor. ‘Arwa, de schoondochter van Asma, nam het stokje van haar over. ‘Arwa had zelfs de macht over Yemen gedurende bijna een halve eeuw! Het is opmerkelijk dat bijna iedereen deze vrouwen vergeten is. Zelfs Westerse islamkenners schijnen dit deel van de geschiedenis niet te kennen. Zo zei Bernard Lewis dat er “geen koninginnen in de islamitische geschiedenis zijn en dat het woord koningin, als dat al voorkomt, alleen gebruikt wordt voor buitenlandse heersers in Byzantium of Europa. Er waren een paar momenten waarin moslim dynastieën kort geregeerd werden door vrouwen, maar dit werd gezien als een dwaling en een wandaad.”. Er zijn nog veel meer vrouwelijke staatshoofden, dus wanneer Lewis zegt dat er maar een paar waren, lijkt niet juist. Het vrouwelijke kalifaat lijken de meeste moslims inderdaad snel te willen vergeten, maar de Yemenitische geschiedkundige, hedendaagse én klassieke, verwijzen niet naar deze malikaat (koninginnen) als schandalig, maar juist als prestigieus en zij bestempelen bovenal hun regeerperiode als succesvolle momenten in hun geschiedenis. Sommige geschiedkundigen vergelijken hun heerschappij zelfs met de invloed van sommige imams en zeggen: ,,’Arwa heeft monumenten, gebouwen, wegen, moskeeën en nog veel meer achtergelaten. Veel meer dan werd bewerkstelligd gedurende een lange periode van macht van imams”. Nu lijken deze vrouwen uitzonderingen, en in de Arabische context misschien gevallen apart. Ergens anders in de wereld was het de normaalste zaak van de wereld dat vrouwen als koningin de boel regeerden. Ibn Battuta, de islamitische Marco Polo, reisde vanaf Tanger als islamitische rechtsgeleerde de hele toenmalige islamitische wereld rond. Zo kwam hij ook op de Malediven, wat tegenwoordig overigens het enige land ter wereld is met een moslimpopulatie van 100%. Dit maakt het niet alleen een heel geliefde honeymoon bestemming, maar ook nog eens een “halalle” en misschien daarom dat Ibn Battuta daar zelf ook getrouwd is. Hoe dan ook, in Ibn Battuta’s reisverslagen kunnen we lezen dat de Maledivers een vreemde gewoonte hadden; Zij werden namelijk geregeerd door een vrouw. Er waren drie Sultana’s daar (nee, niet de koekjes, maar echte vrouwelijke Sultans), en nog eens vier in islamitisch Indonesië. Ibn Battuta noemde het vreemd, maar heeft het nooit afgekeurd of verworpen. Hij stond zelfs met zijn mond vol tanden toen hij Sultana Khadija ontmoette. Ibn Battuta, zelf een qadi (rechter) afkomstig uit een redelijk strikte regio van de Maghreb, vond het geen fantastische gewoonte voor moslims, maar reageerde toch vol lof over de kwaliteiten en capaciteiten die deze Maledievse vrouwen bezaten. Khadija regeerde 33 jaar! Na haar nam haar zus Myriam het over en daarna diens dochter Sultana Fatima. Ibn Battuta was uiteindelijk zo te spreken over deze vrouwen dat hij de stiefmoeder van de Sultana trouwde. Hij schreef uitgebreid over hun goede karakter die hij als meest integer, vroom, solide in geloof en oprecht omschreef. De Maledivers waren de beste moslims die hij had ontmoet. Er was alleen één ding wat hij toch echt niet leuk vond; de Maledievse vrouwen liepen er namelijk half naakt bij; zo schrijft hij ,,de vrouwen van deze eilanden bedekken hun hoofd niet, ook hun koningin niet, maar ze kammen hun haar en voegen het samen aan een kant. De meesten van hen dragen alleen een wikkelrok welke hun middel tot aan hun knieën bedekt, maar de rest van hun lichaam blijft onbedekt. Zo lopen ze dan over de bazaar en overal. Toen ik Qadi werd wilde ik deze praktijk tot een einde brengen en beval hen om kleren te dragen; maar ik kreeg het niet voorelkaar.” Hij kreeg alleen voorelkaar dat ze hun lichamen bedekten in zijn shari’a rechtbank. Ondanks dit kleding issue, had hij toch een zeer hoge dunk van de Maledievse vrouwen en hij vergelijkt hen later nog met de goed bedekte dames van Indonesië, waarbij de onbedekte Maledievse vrouwen toch echt beter afstaken qua karakter en gedrag. Nu moeten we niet denken dat hij heel liberaal was; want de mannen die niet naar juma (het verplichte vrijdaggebed) kwamen werden kaalgeschoren en zo door de bazaars geleid ter vernedering. Ibn Battuta heeft echter nooit sancties gelegd op de gebrekkige kleding van de maledievse vrouwen. Twee zaken in dit verhaal van ibn Battuta vind ik vandaag nog interessant. Allereerst, het gegeven dat het in de achtste eeuw van de Islamitische jaartelling normaal was voor moslimvrouwen om te regeren. Het was misschien even ánders dan ibn Battuta gewend was, maar het werd niet afgekeurd, nog tegengewerkt. En een tweede; dat de vrouwen, zonder dat ik dit gebruik zelf wil onderschrijven, maar dat zij toch de keuze qua kleding hadden, en ook vrij waren om zichzelf te blijven. Desondanks werden ze door Ibn Battuta als goed en zelfs als vroom omschreven. Dit is voor mij een ultiem voorbeeld dat het qua goede moslim zijn, niet om het uiterlijk maar om het innerlijke karakter en gedrag draait. De kritische luisteraar is het misschien opgevallen dat in alle verhalen die ik vertelde, de autoriteit aan vrouwen verleend wordt door mannen. Dit heeft verschillende oorzaken; maar de belangrijkste heeft simpelweg te maken met wie de ‘overleveraars’ van de informatie waren; en dat waren mannen. De vraag die op het eind bij mij rees was; waarom is er ondanks zoveel materiaal van vrouwelijke autoriteiten in de geschiedenis van de Islam, zo weinig bekendheid hierover? Er is nog weinig onderzoek naar gedaan, maar velen hebben aangekaart dat vrouwen structureel uit de geschiedschrijving gebannen zijn; dit is overigens niet alleen zo in de islamitische geschiedenis, maar in alle patriarchale culturen, die nagenoeg bijna de hele wereld behelsden (grof gezegd). Boeken werden herschreven maar dan zonder de vrouwelijke verhalen; die werden eruit gefilterd. Of soms nog makkelijker, de verhalen over vrouwen werden er gewoon uitgescheurd. Soms werden boeken zelfs geheel verbrand./ De geschriften die bewijsmateriaal bevatten van vrouwen met autoriteit en die nog wel bewaard zijn, zijn vaak nog onvertaald dus nauwelijks toegankelijk, of zwaar bediscussieerd en worden divers geïnterpreteerd of als feministisch afgedaan. Zo is er de hadith van Umm Waraqah, die expliciet toestemming/ opdracht kreeg van de profeet om voor te gaan in het gemengde gebed van haar huishouden vanwege haar excellente kennis van de Koran. Deze hadith wordt nog wel volledig in vroege hadiethverzamelingen vermeld, maar in latere hadithverzamelingen wordt alleen nog maar gesproken wordt over haar excellente kennis maar staat er niets meer over het voorgaan in gebed. Er is dus meer onderzoek nodig om nog meer verhalen toegankelijk en bekend te maken om zo een nieuw bewustzijn te creëren. Niet alleen over het bestaan van deze vrouwen, maar ook over hun boodschap en hun autoriteit. Iemand vertelde me eens; “importeer nooit andermans beperkingen”; als er dus gezegd wordt dat vrouwen bepaalde functies niet kunnen bekleden; mógen wij daar kritische vragen bij stellen. Dit heb ik ook gedaan. Zoals ik hier nu sta; ik ben geen uitzondering. Wij allemaal zijn geen uitzondering, net zo min als de vrouwen in de geschiedenis. Mensen zeggen wel eens; “leuk Anne, die verhalen over deze vrouwen, maar dat zijn de uitzonderingen”. Mijn antwoord is dan; “Goh, dan zijn er wel heel veel uitzonderingen en ook wel veel autoritaire uitzonderingen. En dit zijn slechts de “uitzonderingen” waarvan we afweten”. Vrouwelijke visies, daadkracht en de geschiedenis van invloedrijke vrouwen zijn te lang ondergewaardeerd en onderschat geweest. Het is tijd voor een nieuw bewustzijn. Een nieuw bewustzijn van invloedrijke moslimvrouwen, waarmee ik hoop dat we uiteindelijk kunnen werken naar het ideaal dat de eerste man in mijn verhaal eeuwen geleden al bepleitte: “God houdt zich niet bezig met uw uiterlijke vormen. De kern van de zaak is niet vorm, maar intentie”. Door de geschiedenis te herschrijven denk ik dat we de kracht kunnen vinden om vanaf nu opnieuw geschiedenis te schrijven. Een zelfbewuste, inspirerende geschiedenis met nieuwe inzichten. Ten slotte wil ik jullie de wijsheden van de genoemde vrouwen nogmaals meegeven: Rabi’a’s wijsheid van het niet fixeren op anderen, maar op de intentie van de religie in jezelf; het aanbidden van Allah uit liefde voor Allah, in plaats van het aanbidden van de beloning. Nafisa’s voorbeeld als vrouwelijke geleerde en autoriteit, maar vooral haar dialoog binnen de Ummah. Het uitwisselen van gedachten en het samen bidden en discussiëren – het kan dus wel. En het politieke leiderschap van de Malika’s van de Jemen, maar ook van de Sultana’s van de Malediven. Ibn Battuta accepteerde hun leiderschap. En de Maledievse vrouwen bleven gewoon wie ze waren, en kun karakter en gedrag werden toch geprezen, wat aantoont dat het niet om het uiterlijk draait maar om het innerlijk en gedrag. Allahu ‘Alem. Anne Dijk is religiewetenschapper. Bovenstaande tekst werd door haar uitgesproken tijdens het 30-jarig jubileum van Al Nisa op 22 september 2012. Voor meer informatie hierover: www.alnisa.nl. (Ibn Saʿd, Kitāb al-Ṭabaqāt al-kabīr,1:333; Ibn Ḥanbal (d. 241/855), Musnad Ibn Ḥanbal 3:497, 5:425; Bukhārī, al-Tārīkh al-kabīr, 5:259). Attar, Farid al-Din., ’Muslims Saints and Mystics. Episodes from the Tadhkirat al-Auliya’ (‘Memorial of the Saints’)’, Translated by A.J. Arberry. London: Routledge & Kegan, 1983, p. 51 zie ook Munawi, al-Kawakib al-Durriya vol. 510 and Sibt Ibn al-Jawzi, Mir’at al-Zaman vol. 265 b.
 Kecia Ali: The Jurist and the Saint: Sayyida Nafisa, Biography, and the Construction of Muslim Women’s Authority. CURA Conference, January 24th2012. A shelved EU draft definition of anti-Semitism is being used to stifle criticsm of Israel on US campuses. The council has been co-directed by Richard Barton, national education chairman of theAnti-Defamation League — one of the most powerful groups in America’s pro-Israel lobby. Its report claims that Palestine solidarity activities were “undermining Jewish students’ sense of belonging” and creating a hostile environment. Israel lobbyists have often misrepresented the nature of the text and its contents. The Anti-Defamation League’s Richard Barton, an author of the University of California “campus climate” report, has tried to convey the impression that the draft text has an official status by calling it the EU’s definition of anti-Semitism (“Protests must not stray into anti-Semitism,”San Francisco Chronicle, 23 August 2012). Richard Cravatts, current president of the pro-Israel national academic watchdog groupScholars for Peace in the Middle East, believes that it has become “more difficult” for “Jew-haters” on campus to defend themselves from the charge of anti-Semitism, citing approvingly the “significant” working definition (“ Antisemitism and the Campus Left,”Journal for the Study of Antisemitism , Vol. 3:2801 [PDF]). BETHLEHEM, (PIC)– A group of Jewish settlers pumped, on Thursday morning, wastewater from a settlement in the west of Bethlehem in southern West Bank, onto Palestinian agricultural land. Ahmed Sukkar, head of the village council in Fukin village, told “Quds Press” that settlers pumped wastewater on lands in the village, damaging an area of 50 dunums. He pointed out that this is not the first time the settlers pump industrial waste or wastewater through pipes installed in the region, which led to damaging the lands and the crops. Sukkar cautioned of the environmental and health dangers caused by such acts on the area’s residents and farmers.